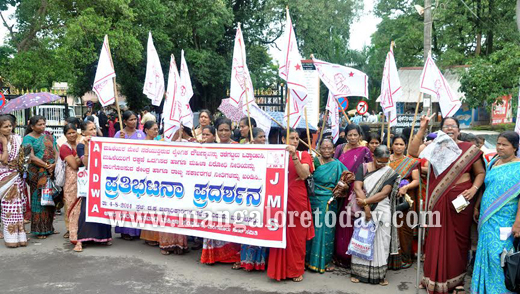 Mangalore, Aug 04, 2014: The Mangalore city unit of the Janavadi Mahila Sanghatane organised a protest in front of the DC office in the city on August 4, Monday demanding stringent action against perpetrators of crime against women. The protestors voiced their concern over the rising cases of sexual crimes against women in the state in the recent past. They alleged that the BJP was staging protest on the issue merely to gain political mileage taking advantage of the fact that it was the Congress Government which was in power in the state. Jayanthi B Shetty, city unit chief of the Sanghatane and former corporator questioned if the BJP had protested when the Sowjanya case, home stay attack and Padmapriya mysterious death cases were reported during its tenure. 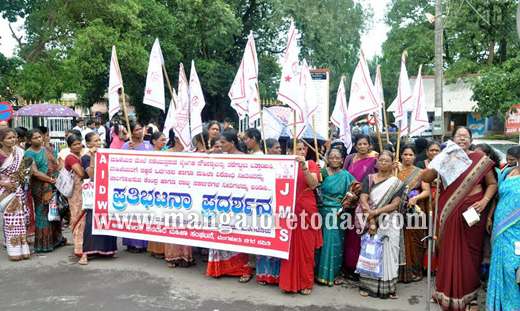 Hemalatha, DK Chief of the Sanghatane, Padmavathi S Shetty, Vice President, Kirana Prabha, Secretary and others participated in the protest.